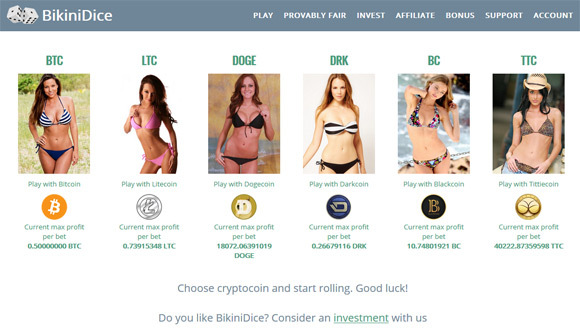 DiceCoin is a simple to use online betting game of Dice where you can test your luck by rolling the dice and seeing if you can manage to beat the house and get more Bitcoins than you started with. 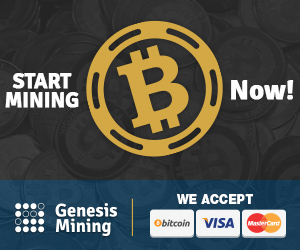 There is no need to register, you just open up the game and can start playing immediately – you can even play for free by getting a bonus of 0.00001 BTC (1000 satoshi) from the built-in Faucet, so no need to deposit coins. The service offers two modes of play – manual single bets as well as an automatic betting mode that allows you to play using a Martingale betting strategy by multiplying the bet on loss for example. 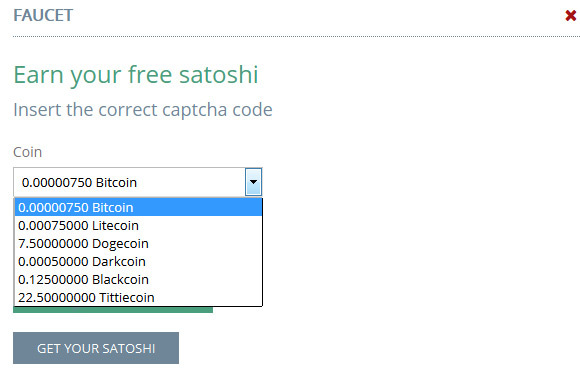 The minimum bet is just 1 satoshi and the house edge is just 1% and the algorithm used is provably fair. Primedice is one of the most popular and trusted Bitcoin games, it offers a reliable, quick, and simple way to play Dice with your Bitcoins. 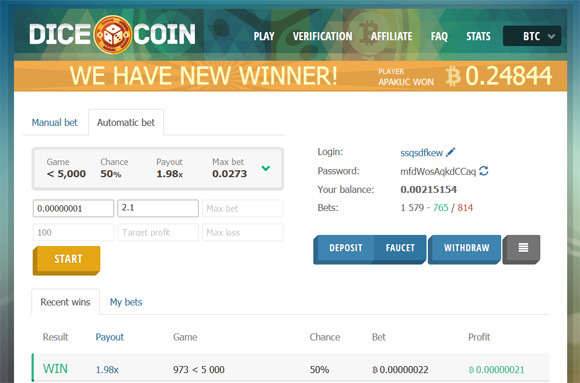 There is no need to deposit anything in order to test your luck, you can play for free and start right away – all you need to do is to click on the Faucet inside the game,enter the captcha and you will immediately get 200 satoshi in your account to play with. 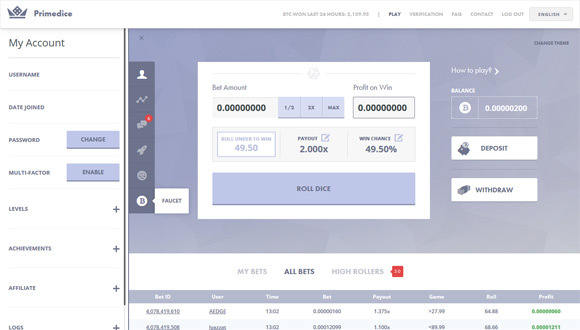 The game allows you to play with bets as low as just 1 satoshi, so you can get at least 200 rolls if you play with the minimum and happen to lose all of your bets (hardly ever possible). Of course you can also deposit Bitcoins in your account should you decide that the faucet amount is too little and you are feeling lucky. The house edge when playing Primedice against the house is only 1%. However, the house edge when playing against another player (PVP) is 0% – there is absolutely no fee or gimmick associated with this, so do try your luck against other players and not only versus the house. To engage in a PVP dice duel begin by clicking the chat tab on the left hand side of your screen and then selecting the “PVP” room at the bottom of the chat tab. Here you can chat and find a user looking to wager the same amount as yourself. When you find an opponent you need to issue a Challenge and you can start playing against each other. Primedice rewards its active players with upping their user levels and giving them achievements. Levels are gained by reaching a certain threshold of experience for each respective level. 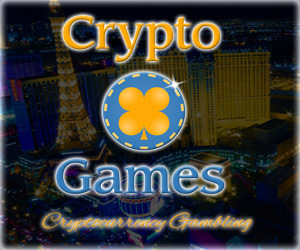 You can gain experience by wagering coins, being active in chat and unlocking achievements. By gaining levels you earn a boosted faucet which provides you with far greater rewards and not to mention baller status and bragging rights in the community. The service offers state of the art verification which allows users to check the integrity of every roll and confirm they are not manipulated. Random numbers are generated through the use of two seeds, a server seed, and your client seed. The server seed is created before you specify your client seed, ensuring that a server seed purposely in our favor cannot be generated. Together, along with the nonce (# of bets made with seed pair), the seeds are used to create a provably fair roll number within the 0-99.99 range.